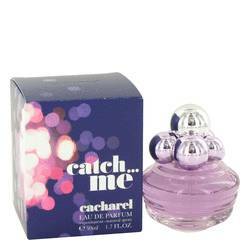 Catch Me L’eau Perfume by Cacharel 2.7 oz Eau De Toilette Spray for Women. Ensure that you smell fresh all day by spritzing Catch Me L’eau from the French design house of Cacharel onto your pulse points. This delicious fragrance for women was created in 2014 and features notes of jasmine tea, mandarin, star anise and orange blossom. The sweet, spicy aromas blend with a warm note of petitgrain to create a beautiful, lingering scent, and the unusually shaped bottle adds a uniquely feminine touch to your countertop or vanity.